The National Retail Federation predicts holiday sales will rise by up to 4 percent. 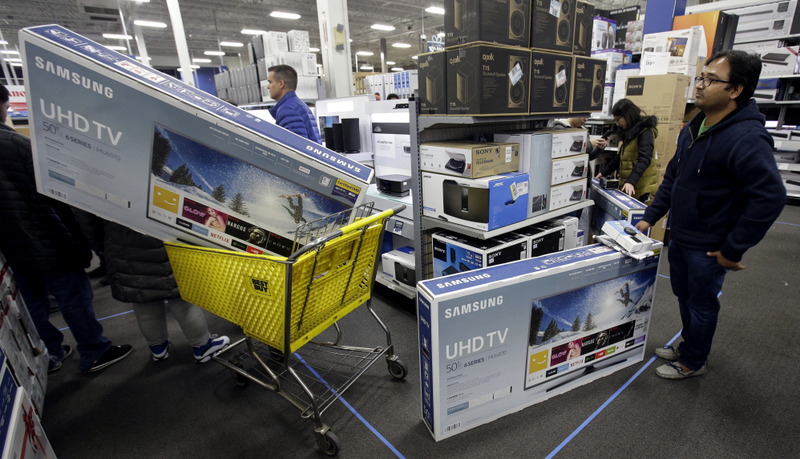 NEW YORK — As shoppers have bought TVs and toys so far this holiday season, they’ve shown a desire for deals but also an inclination for some impulse spending, retail experts say. Shoppers were on track to spend more compared to last year. The National Retail Federation trade group called spending so far “robust,” and reiterated its forecast that holiday sales will rise by up to 4 percent. More than one-third of shoppers surveyed by the NRF planned to make all their purchases on sale over the five days of Thanksgiving to Cyber Monday. That’s similar to last year, and up from 11 percent in 2015. The discounts appeared slightly smaller this year on Thanksgiving and Black Friday compared to last year, according to research firm Market Track LLC. It analyzed Black Friday circulars at retailers including Wal-Mart, Target, Sears and Best Buy and found that the advertised discounts averaged 45 percent this year compared to 48 percent last year. “Shopper are looking for deals, but there wasn’t significant price slashing,” said Ryne Misso, Market Track’s director of marketing. He noted that stores tried to simplify discounts by offering blanket sales and doing less bundling, such as offering two-for-one deals. But there were bargains to be had. On Saturday at the Garden State Plaza in Paramus, New Jersey, stores from Macy’s to J.C. Penney slashed prices at least 40 percent in many departments. And Macy’s had a display of coats at 80 percent off. On Cyber Monday, 89 percent of orders came with free shipping, up just slightly from last year, says Salesforce, which tracks the buying activity of 500 million global shoppers. As online buying has made shoppers armed with mobile phones more purposeful, retailers from Target to Saks Fifth Avenue are making a bigger push to offer grab-and-go items. Target has set up kiosks stocked with items such as fun socks and beauty items throughout the store. J.C. Penney has “Penney Lane” kiosks filled with items under $10 like air fresheners and adult coloring books. And luxury retailer Neiman Marcus has grab-and-go gifts too, but they’re under $200. They include a unicorn-shaped body pillow for $35 and fingerless fur mittens for $70. Amazon said Wednesday that Cyber Monday was the biggest shopping day in its history, but didn’t provide figures. But analysts reportedly estimated $1 billion in revenue for its Prime Day event in July. It also said Cyber Monday orders on its app jumped more than 50 percent from a year ago. Online buying from Nov. 1 to Monday was up 17 percent from a year ago to $50 billion, says Adobe Analytics, the research arm of the software maker. Store traffic, though, has continued to fall. Shopper visits were down by 1.6 percent on Black Friday, compared with a 1 percent drop in the prior year, according to research firm ShopperTrak. It calls the declines “far less substantial” this year and last than in earlier years.